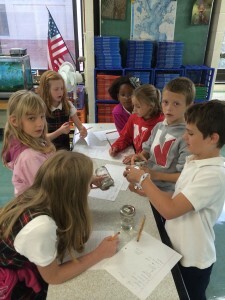 The 3rd grade students have been very busy in the STREAM Lab the past few weeks. With the assistance of Mr. Gardon and Mr. D’Arienzo the group has been getting into the Lab and participating in some hands-on STREAM activities. On September 23 the students observed the movement of marbles in four jars containing different clear liquids (water, corn syrup, glycerin and mineral oil). The student’s challenge was to predict and then observe the order of the liquid the marbles moved, slowest to quickest. Following the predictions, the students explain why they ordered the liquids the way they did.